If you have a bad radiator, you won’t want to run your car. When your radiator is shot, you’ll notice that the temperature of your engine is spiking, and that can lead to major issues if you don’t pull over and kill the engine right away. Overheating can cause irreparable damage to your engine, which may mean that you’ll have to replace it to get your car running again. Fortunately, if you catch your vehicle overheating and pull off the road to let it cool down, it shouldn’t incur much damage. That’s why we urge folks to keep their eyes out for signs that their radiator is failing — we’ve listed a few of those signs below. And, when your radiator does fail, you can always count on your local mechanic here at Urban Autocare. We’re proud to serve our neighbors throughout the Denver Metro area from our auto shops in City Park West and Lakewood. Feel free to schedule service for your vehicle today! Overheating engine: First and foremost, you should be wary of your engine overheating. Keep an eye on the temperature gage on your dash. It’ll have a red line, which your car should never reach under normal conditions. If your car is overheating, or “red-lining,” then you ought to pull over — your radiator is no longer properly maintaining the temperature of your engine. Inconsistent temperatures: Similarly, your engine’s temperature shouldn’t fluctuate much as you drive it around. Ideally, your vehicle will start cold when you turn the key (at the bottom of the gage), and it should reach a moderate operating temperature as the engine and radiator balance the heat. If you’ve noticed that the temperature of your gage is fluctuating between hot and cold, or it simply won’t sit still, then something is wrong with your radiator system. You may have a sludge buildup in your radiator, your water pump (which pushes coolant through your engine) may be malfunctioning, or your fan (which pulls cool air through the engine and through the fins of your radiator) may not be operating as it should. In addition, you may not have sufficient coolant in your system to operate properly. 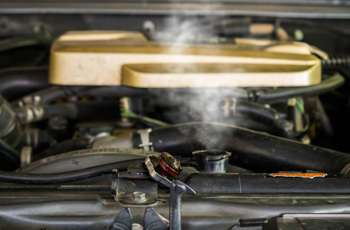 Bring your vehicle in to an auto shop to assess the problem at hand — you may not need to replace your radiator entirely. Coolant leak: If your radiator has sprung a leak, you could notice that your vehicle is beginning to overheat as you run it. In addition, you may actually be able to observe coolant dripping from underneath the engine compartment of your vehicle. Leaks can spring out of any of the components of a cooling system, so, once again, you’ll have to bring your car into an auto shop if you notice a leak and can’t locate the source of the problem. Steam from the engine compartment: Your engine should never be pouring out steam. If you notice steam as you run your vehicle, then it’s likely that you have coolant leaking onto your engine. When this happens, the coolant will evaporate quickly, thus the steam. Pull over if you see steam coming from your engine, and turn of your vehicle. A leak may have sprung in your radiator or radiator lines, and your radiator cap may have failed or shot off. Sludge buildup: Over time, sludge will slowly build up in your radiator lines, especially if you don’t give your system a flush in its recommended interval. Sludge can be created by particles that can come loose in your coolant line, and eventually, your coolant can break down to create this problematic sludge. When this happens, you’ll have to have your system flushed to release the blockage. Sludge buildups can result in engine overheating and they can cause temperature fluctuations. Lost or broken cap: Your radiator has two caps: the cap on the overflow reservoir and the cap on the radiator itself. Both of these caps are liable to fail, and, if enough pressure builds up within your cooling system, these caps could shoot off. When this happens, you could see steam pouring out of your engine, and you could see the temperature of your engine spike. Don’t drive with a lost or broken cap, get a replacement. Beyond radiator replacements, we also provide fluid flushes and various radiator repairs. If you’ve noticed that your vehicle is overheating, or if you simply think it’s time to bring your car into the shop for its regular flush interval, we can help you out. Feel free to learn more about our other cooling system repair and maintenance services. When your radiator is at the end of its life, we’re here to swap it out. We’re proud to serve folks throughout the Denver Metro and Lakewood area with our radiator services, including radiator replacements. Count on Urban Autocare for any radiator issues that you may have — schedule an appointment today!